Checking in for a sneaky lunch time pint & wings. Enjoyable wee pub. 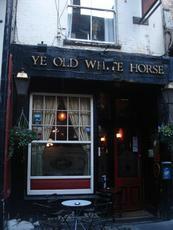 Called in last nite for a cheeky pint - I missed you Ye Old(e) White Horse. This is a great wee pub oozing with Irish charm. The owner is Irish and the two bar men are also Irish (Well, upon my last visit). The pub is has character and is clean. The drinks range is good. The Guinness is very very nice - for London?? The selection of ales included tribute, landlord, speckled hen and pride with the Timothy Taylor by far the most enjoyed pint. The music is fantastic. Great range of genres to suit all. Ok, on a friday this is a bottle neck to get into - so get in early! Food is very nice and well reasonable. The charming staff are the key to the success - the two Irish guys behind the bar are a class act. Kept us entertained just watching them. Service was exceptional. The bar man took my wet umbrella and coat to hang up and returned with a seat for me and my partner followed by TABLE SERVICE - result! But keep it quiet, this pub is a quiet gem Ssshhhhh.